Ice cold lemonade is one of summer’s simplest pleasures. As a frozen pie, it’s even better. 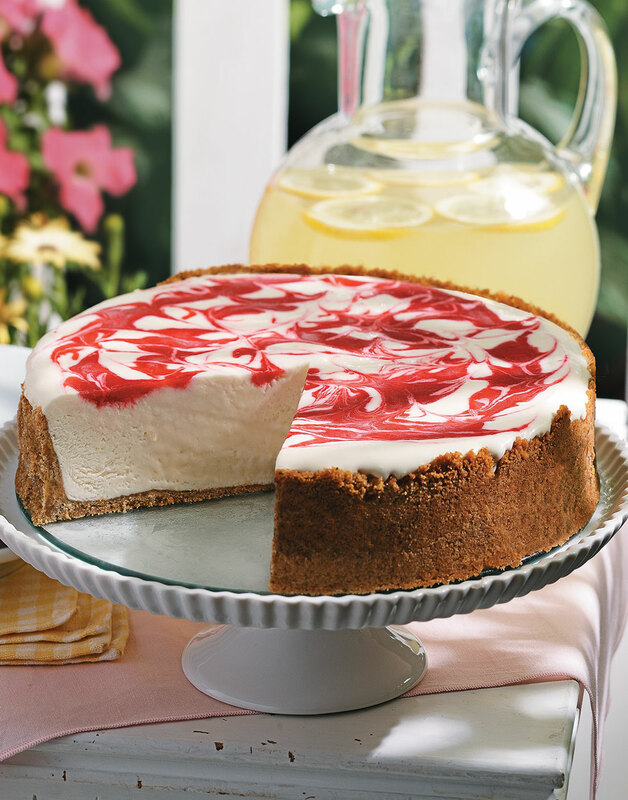 One bite of this retro dessert and you’ll have a new favorite way to chill out this summer. __Make your own frozen citrus concentrate: __This quick, easy recipe for citrus concentrate makes the perfect amount for the pies. Heat 3/4 cup sugar and 1/2 cup hot water in a saucepan until the sugar dissolves. Stir in 2/3 cup strained fresh lemon or lime juice. Transfer to a loaf pan or other freezer-safe container. Cover and freeze until solid. Preheat oven to 375°. Coat a 9-inch springform pan with nonstick spray. For the crust, process vanilla wafers and mint in a food processor until sandy. With the machine running, drizzle in butter and continue processing until mixture clings together. Press crumbs into bottom and half to three-quarters of the way up the sides of the prepared pan. Tamp down crumbs with the bottom of a measuring cup. Bake crust until browned and set, 8–10 minutes. Remove pan from oven and let cool completely. For the sauce, purée raspberries and sugar. Strain mixture through a fine mesh sieve; discard seeds. Bring to a boil in a saucepan over medium-high heat. Combine water and cornstarch in a small bowl for the slurry. Whisk slurry into boiling raspberry mixture. Boil 1 minute to thicken slightly and eliminate cornstarch taste; transfer to a bowl and chill. For the filling, beat cream, sugar, and vanilla in a bowl with a hand mixer on medium speed to stiff peaks. Whisk together concentrate and condensed milk in a separate bowl, just until combined. Fold whipped cream into the concentrate mixture; transfer to cooled crust. Drizzle ¼ cup cold raspberry sauce over filling. Swirl a skewer or knife through the sauce to marble. Cover pie with plastic wrap and freeze until solid, 8–24 hours. Thaw pie 30 minutes in the refrigerator before serving. Once the butter is added, process the wafer crumbs just until the mixture begins to cling together. A small measuring cup is an ideal tool to press the crumbs into the edges and up the sides of the pan. Whisk condensed milk with concentrate just until combined. Stop whisking before it gets soupy. Drizzle the raspberry sauce randomly around the top of the pie for easier swirling and marbling. For the easiest slicing, dip a long-bladed knife into hot water and wipe clean before cutting each slice.